An explosion in the feral hog population causes problems on ranches and in suburbia. A tough winter left the mesquite trees barren of leaves and the grass a dormant shade of brittle brown. From a helicopter, the landscape is unremarkable, save for the occasional canyon that scours through the rust-red dirt of the Texas Rolling Plains. A hundred feet beneath us, the land slipping past is mostly a contiguous patchwork of brush, cactus and grass. Conspicuously, though, large swatches of freshly turned earth break the topographical monotony. This ranch is overrun with feral hogs. On a warm February day, I join Boedeker on his latest assignment: controlling the exploding wild hog population on an expansive ranch northeast of Lubbock. 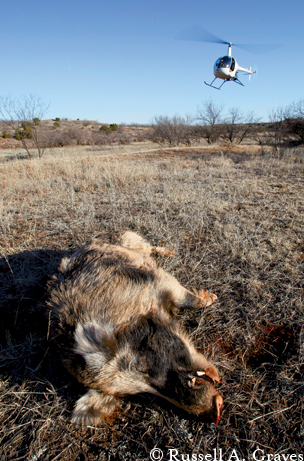 Boedeker is licensed to perform animal damage management, and in the Big Country of northern Texas, a helicopter and a shotgunner are an efficient means of putting a small dent in a hog population that has become increasingly problematic. As we traverse the ranch, damage is everywhere, and it’s fresh. Overnight, dozens of pigs had rooted for food and wallowed in wet areas to cake themselves in mud. That’s where the problem begins. Their rooting upsets native plant communities, affects the productivity of rangelands from a livestock-grazing standpoint and affects native wildlife species like the ground-dwelling bobwhite quail — a bird whose numbers have been slipping for the past half-century. A long snout and broad, stout shoulders enable pigs to efficiently turn the earth in search of seeds and insects in their never-ending search for food. When the weather warms, the pigs, unable to sweat, create wallows in the mud to cool themselves. Attracted by water, feral pigs are also detrimental to wetlands. When the day is done, we know we’ve made a dent in their population, but the numbers will creep back — pigs are made that way. Capable of having two litters a year and six to 10 babies at a time, pigs are a veritable time bomb. Their numbers continue to expand across the state. 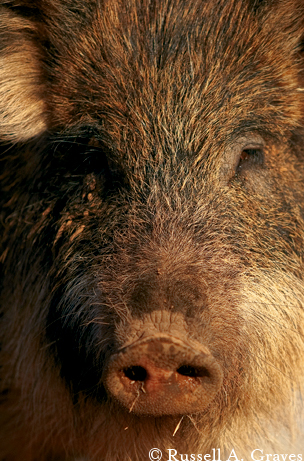 Currently, Texas is home to roughly half the nation’s feral pig population. 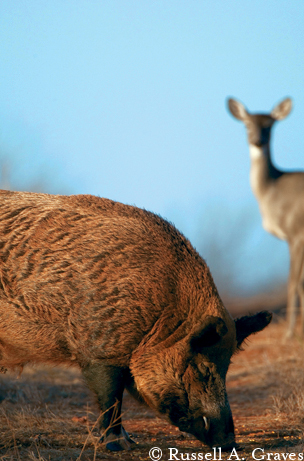 “There are two kinds of landowners in Texas — those with feral hogs and those about to have feral hogs,” says Billy Higginbotham, wildlife and fisheries specialist for Texas AgriLife Extension Service in Overton. Higginbotham is on the front line in the war on feral pigs. While estimation models on population are hard to establish, Higginbotham says the number probably falls between 1 million and 2 million. That’s a lot of variability, but that’s the mysterious nature of the feral pig. For 350 years, pigs have called Texas home. First brought to North America by Spanish explorers, domestic pigs spread throughout the continent as pioneer settlements fanned across the nation. The term “feral” refers to wild animals whose lineage is traced to domestic stock. While the feral hog population was kept in check throughout most of the hog’s North American history, the introduction of European (Russian) wild boars for sporting purposes in the 1930s set the stage for the pig population in Texas today. Wild boars interbreeding with free-ranging domestic hogs and domestic hogs released from captivity on farms lit the fuse on the population bomb. Biologists generally agree that there probably aren’t any full-blooded Russian hogs left because of breeding with pigs whose lineage is traced to domestic pigs. Instead, Texas pigs are a mixture of a few hybrids. Two decades ago, the Texas pig population reached a critical mass, and the population grew exponentially. The growth brought major problems. Farms and ranches pay the price for the incessant rooting, with the annual damage to agricultural crops exceeding $50 million. According to Higginbotham, that’s a conservative estimate. Texas AgriLife Extension puts the average vehicle damage at $1,200 per incident. While the total number of pig-and-vehicle collisions is hard to estimate, anecdotally, the trend is on the rise — especially in populated areas, where pigs have found an abundance of water and cover to their liking. Jessica Alderson, an urban wildlife biologist with the Texas Parks and Wildlife Department in Dallas/Fort Worth, paints a bleak picture for suburban landowners whose neighborhoods overlap with feral pig territory. These suburban pigs cause problems beyond landscape damage. Water standing in wallows creates breeding pools for mosquitoes, which increases the risk for mosquito-borne illnesses like West Nile virus. Stagnant water poses additional water quality issues, such as creating breeding areas for biological enemies like E. coli. Ninety miles northeast of Dallas/Fort Worth, Garry Mills is doing all he can to control pigs on his properties. Mills raises crossbred cattle and farms hay on several places east of Bonham. He hasn’t seen the problem decline in his 20 years of farming and ranching. Mills, like others in the agriculture industry, deals constantly with a multitude of problems. On his ranch, pigs squeeze under fences and break tightly stretched barbed wire, allowing his calves to escape. They eat pecans that fall from his trees, reducing the yield potential on his commercial pecan crop. Pigs root in his hay fields, creating swine-sized divots that damage his equipment. Short of using a helicopter, Mills employs all of the recommended techniques for population and damage mitigation on his property. As a hunter, he and others often dispatch pigs with rifles. Since this invasive species is considered an exotic animal by TPWD, they can be legally hunted year-round with no harvest limit. This makes Texas a popular destination for hunters nationwide. (A license is required for recreational hunting, but not to control hogs that are damaging crops or property.) The feral pig problem has created new opportunities for hunters in Mills’ area. When he’s not shooting pigs, Mills traps them throughout most of the winter. He makes a little pocket change by selling the pigs to a local hog buyer. Pig trapping is a cottage industry that’s providing landowners and hunters the means to make a little money while keeping porcine numbers in check. Near Paducah, Gaylon Tucker says the number of hogs coming into his hog-buying station is steadily growing. Tucker’s business is just one of more than 90 Texas Animal Health Commission-sanctioned holding stations where trappers are allowed to transport and sell pigs. The commission regulates wild hog movements because of their potential for spreading diseases to domestic livestock herds. A study conducted between 2003 and 2008 showed that 20 percent of wild swine tested positive for pseudorabies and 10 percent had swine brucellosis. Pseudorabies is an economically harmful disease that affects domestic pigs as well as animals such as deer, coyotes and raccoons. Despite its name, it is not a rabies-type disease but a swine herpes virus that can affect the respiratory and nervous systems. Brucellosis affects fertility and induces abortions in both cattle and pigs. For the past 15 years, Tucker has bought about 1,500 pigs a year from local trappers. The pigs are shipped to a Fort Worth meat processor, and most of the meat is shipped to Europe. Tucker says that he won’t buy just any pig. It has to weigh at least 50 pounds to make the cut. While he talks, I scribble on a notepad and do some quick math. That’s more than 400,000 pounds from this one station in one year. His busiest time is in fall and early winter.